Today in Beijing, Oppo unveiled its latest entry in the high-end smartphone fray, the Oppo Find 5. The device was launched at a snazzy event that was quite impressive, which is telling for Oppo’s ambitions to become a recognized player in the bustling international mobile industry. Our Darcy LaCouvee attended the Oppo Find 5 launch event, and got up close and personal with the new full HD device. The device’s most striking feature is the full HD LCD display that boasts an amazing 441ppi pixel density. That’s the same resolution and pixel density as the display of the HTC Droid DNA/J Butterfly/Butterfly. All those pixels require a beefy processor, and the Oppo Find 5 does not disappoint. The quad-core Snapdragon S4 Pro chip inside is clocked at 1.5GHz, and will likely dominate the benchmarks for the following months. Another area where the Oppo Find 5 shines is the 13MP camera, which can capture videos at 120fps, for glorious slow-motion and blur-free action shots. That’s not all – the Find 5 is capable of HDR photo and video recording, which is a world first. But how does the Find 5 feel in actual use? Check out our hands-on photo gallery for a better look at the Find 5. 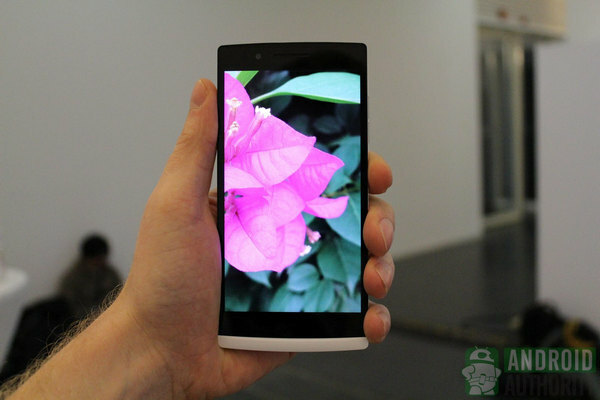 To learn more about the Oppo Find 5, visit our specs page and the official press shots. The phone will cost around $500 (in both China and the US) as expected in the first months of 2013. Tell us, what do you make of the Find 5 and Oppo?